Moving into or out of a home? Downsizing or remodeling? Our storage units are perfect for your belongings. Need storage space for your extra equipment, furnishings or office supplies? See our pricing page for the right-sized unit. Our outdoor spaces are convenient for your boats, trailers & RVs. We are just blocks away from Fremont State Lakes Recreation area. At General Self Storage in Fremont, Nebraska, we have the right space for the right rate. We offer a variety of indoor unit sizes, from 5' x 10' to 15' x 50'. Our outdoor spaces are perfect for trailers, boats, trucks and RVs. 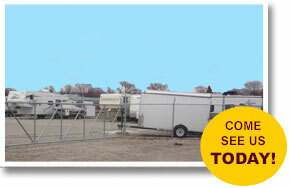 Our storage facility is completely fenced with 24-hour access. Security is our top priority with excellent exterior lighting and video surveillance throughout our storage units. Our outside storage has a key-code entry gate system allowing 24-hour access by authorized persons, so your boats, trailers and RVs are safe and secure. We offer monthly, quarterly and yearly rates. See our pricing page for the right rate for you. Our units are tailored to fit your needs and your budget. We are your local source for convenient and affordable indoor storage units and outdoor storage spaces. Call us today to check what storage units we have available, or check availability on our Pricing page. © 2014 General Self Storage.